Been looking to buy those impossible to find Gnomeo and Juliet Garden Gnomes? 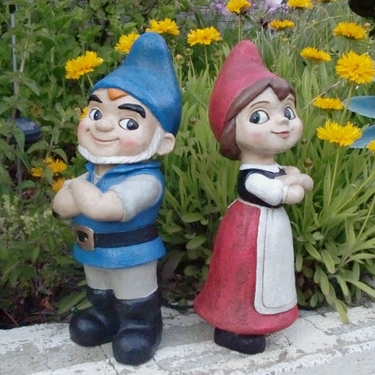 GardenFun.com is thrilled to welcome the most popular garden gnomes around - our hero Gnomeo Montague, and the precious Juliet Capulet! You've fallen in love with the Gnomeo and Juliet movie, and now you can bring home all the whimsical fun right into your own garden with Official Gnomeo and Juliet Statues of your own! How on earth could such an adorable movie like this be released without any Gnomeo and Juliet Merchandise? It's true, Gnomeo & Juliet products have been impossible to find, until now! These officially licensed Gnomeo and Juliet statues are now in stock and ready to ship! We know you've been trying to purchase Gnomeo and Juliet merchandise for a while now, your search is finally over. Be one of the first to purchase the only official Gnomeo and Juliet Garden Gnomes from the smash hit movie Gnomeo & Juliet! Will Gnomeo be able to convince Juliet they should start a garden on their own? Will Juliet have the courage to seek out a new daring adventure? Do you happen to have a garden where these two sweet gnomes could fall in love? Bring home both Gnomeo and Juliet into your very own garden and watch their love blossom before your very eyes! 12" Size. Cast in Poly-Stone Resin with Fiberglass for added durability. Hand Painted. Officially Licensed.